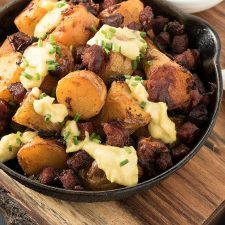 Chorizo potatoes. This is a riff on patatas bravas – one of the most famous tapas dishes of all time. It’s famous for a reason. It’s really good. But jack up the flavour with some chorizo. Drizzle it with some homemade aioli or garlic mayonnaise. That’s great. This is comfort food really. Potatoes. Sausage. Mayonnaise. How can you go wrong? Delicious. Familiar. But different. Special. There’s really only three things in this dish. A bit of spice. But the potatoes are roasted. The little bits of chorizo are bursts of flavour. And texture. Garlicky mayonnaise brings it all together. To get this right you have to get the chorizo right. Funny thing. You need to cook the chorizo to death for this to work. Seriously. It’s completely counter-intuitive. Somewhere along the way it goes from bits of sausage to these little nubbins of concentrated flavour. Sausage flavour bombs. I don’t really understand why. But it works. Taste it along the way. You’ll see. I use this trick often. For duck fat roasted potatoes. For any roasted potatoes really. It’s simple. Boil your potatoes before you roast them. Don’t boil them to death. Just enough. That way you don’t have to worry about cooking the potatoes through. You can focus on getting the outside just right. The inside is already taken care of. Twice cooked potatoes. Works every time. Aioli is just mayonnaise with garlic. Never made mayonnaise before? It’s no big deal. It’s an emulsion.The trick is to pour the oil in slowly. That’s key. The oil combines with the egg yolk. There’s a whole lot of chemistry behind this. But you don’t have to worry about that. All that matters is that it works. Just go slow. It’s not hard. A small food processor makes it a snap. Coddle an egg. Pulse with a few other ingredients. Drizzle in some oil. Done. Delicious. It’s great with simple boiled potatoes too. A bit of parsley. Maybe some butter. Yum. Potatoes with chorizo. This is tapas times ten. 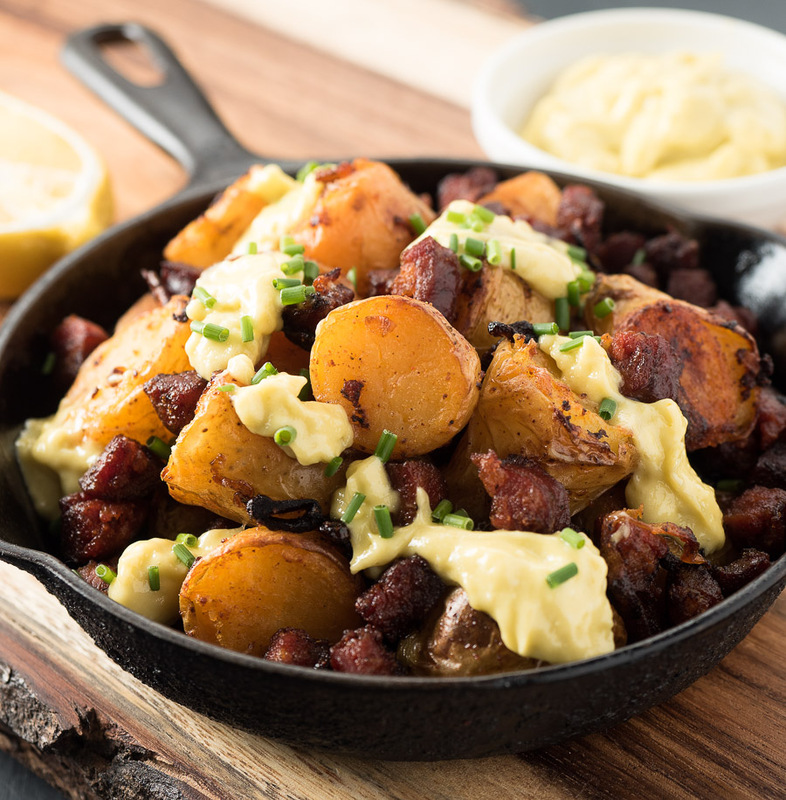 Chorizo potatoes or patatas braves con chorizo is a traditional tapas dish kicked up big time. The chorizo is Spanish. This is not a good place to substitute Mexican style chorizo. 1 lb small new potatoes - cut in big bite size pieces. In a small food processor or blender combine the egg yolk, garlic, sherry vinegar, lemon juice and one Tbsp olive oil. Pulse a couple times. Mix the olive oil and vegetable oil in a container well suited to drizzling. A measuring cup or drinking glass is not the answer here... You will curse. Run the processor continuously while drizzling in the oil. You are making mayonnaise. It will thicken up nicely. Add the salt and taste. If it's not quite right add a bit more salt or lemon. Your call. Boil the potatoes in well salted water until a knife slides into a potato easily. Drain. Heat the olive oil in an oven-proof frying pan over medium heat. Add the chorizo and cook for 3-4 minutes. Stir in the shallot and cook until soft, another minute or so. Now add the potatoes and mix until the potatoes are well coated with oil. Sprinkle them with paprika and season with salt. Place the skillet in the oven and roast for 10 minutes. Stir and roast another 10 minutes. Serve with aioli on the side or drizzled overtop or both. Aioli is all about personal taste. One clove of garlic is pretty garlicky but if you like more or less adjust to taste. Traditional aioli is 100 percent olive oil. That's pretty assertive. A mix of olive and vegetable oil keeps the character of aioli but lightens the flavour somewhat - again do what you like. It's your kitchen! In american, appetizer, italian, pork, sides and stuff. Bookmark the permalink. These look heavenly. 🙂 I am looking to make some homemade chorizo soon and these will definitely be on my list of things to make with it. You know I am always intimidated with making aioli and I think it was because my first batch was disastrous and separated. How long do you usually keep your aioli in the fridge for? They are pretty darn good. A bit decadent maybe but tasty. I usually keep my aioli around for a week on the outside. Not because I’m worried – but because it just gets used up. Can’t wait to see your chorizo. Ahhhh these potatoes look fantastic with the chorizo! My carb cravings are kicking in. My husband usually won’t eat mayo, but if I’m essentially making it from scratch, I bet he’d never notice! I feel dumb for having to ask, but I’ve never “coddled” an egg? The chorizo really puts them over the top. To coddle an egg you just drop it gently into simmering water for 1 minute. It’s a way to address health concerns over raw egg yolks.